Each month, RBC Financial employees send between 10,000 and 15,000 “Instant Thanks” through an online peer-to-peer social recognition program. With more than 75,000 workers, it’s an invaluable tool for engaging staff. Peer-to-peer programs remove the bottleneck when responsibility falls solely on management and makes recognition ongoing, not simply part of an annual review. It’s a strategy that pays huge ongoing dividends—organizations that regularly thank employees outperform those who don’t. Training is essential, not only in terms of how a program works, but also how to give effective recognition. “The key is to recognize folks for actions you want to encourage, things that will drive business,” says Mills. Dynamic programs can evolve to engage employees with new challenges. For instance, one year focus on customer satisfaction, the next on innovation. Always ensure people know why they are being recognized. “For most people it’s not intuitive to stop and say thanks,” says Richardson. “We wanted to make it easy to use and quick—you can do one in 15 seconds.” Most successful programs, like RBC’s, are run through a custom portal: Typically a single sign-up, then a desktop icon or, increasingly, a mobile device. Frequency of use is essential: People won’t participate if the nomination process is too complicated or rules are cumbersome. But keep managers in the loop with a mechanism that advises them immediately when a team member is highlighted. Peer-to-peer programs come in various forms, some are level-driven, others are points-based, whereby staff attain levels or earn points for each recognition—these are accumulated then redeemed for prizes. RBC does award points, but the real value lies in public recognition. 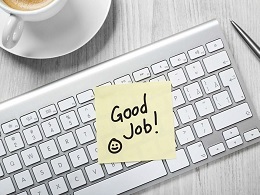 On employees’ computers is a constant feed showcasing Instant Thanks and anyone can jump in to comment. It is also a reminder to participate.